London South Bank University's (LSBU) Borough Road Gallery is hosting a spoken word performance as part of the series of specially curated talks and events that accompany its current exhibition, David Bomberg: Objects of Collection. The spoken word performance will see emerging writers read new poems written in response to Borough Road Gallery's current exhibition David Bomberg: Objects of Collection. The poems are being developed in workshops led by poet Dorothy Lehane at Borough Road Gallery, in collaboration with Dr Karlien van den Beukel, Senior Lecturer in Creative Writing at LSBU. The free performance event will be the first opportunity to hear the poems and will be a unique opportunity to celebrate emerging poetic talent. Established poets Richard Price and Robert Vas Dias, who have both been inspired by David Bomberg in different ways, will also give readings as part of the event. The event, which takes place at 7pm on Thursday 7 November, accompanies the exhibition David Bomberg: Objects of Collection, which runs from 13 September 2013 to 29 March 2014. 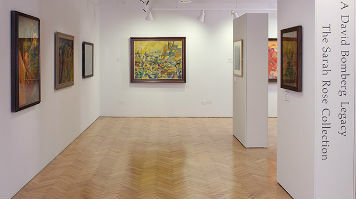 Find out more about Borough Road Gallery or book a place for Writing Bomberg: Poetry and Voice at Borough Road Gallery.